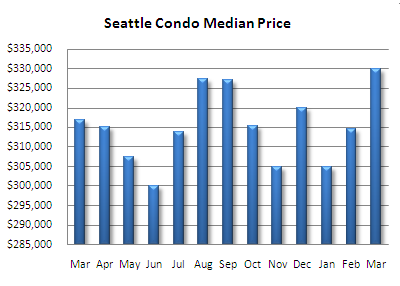 Last month’s market performance figures reflected continued confidence in Seattle’s condo market. The city-wide condo median price rose to a high of $329,975, a 4.1% increase over the same period last year, reversing a two month slide. The condo inventory supply, or absorption rate, decreased for the second consecutive month while the number of sales continues to improve. There were 1,445 active listings in March, a 5.5% increase compared to February and a 52.4% jump over March 2007. The number of pending transactions (properties going under contract) continued to rise which reduced the inventory supply to 5.7 months. 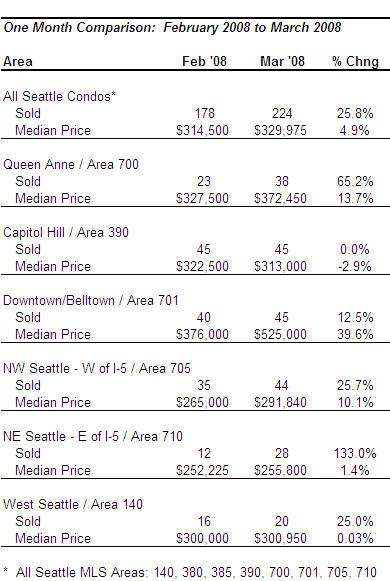 With the exception of Capitol Hill, most neighborhoods reflect normal market conditions based on the absorption rate. The 8.6 month supply rate for Capitol Hill may be attributable to a number of Trace North listings being added to the MLS and new conversion projects. The citywide month-over-month comparison shows improvement in the number of closings (solds), up 25.8%, as well as median price which is up 4.9%. As would be expected for month-over-month figures, most areas of the city reflected improving results. The citywide year-over-year figures reflected fewer sales overall, down 28.2%, with only downtown/Belltown and West Seattle showing increased sold transactions. 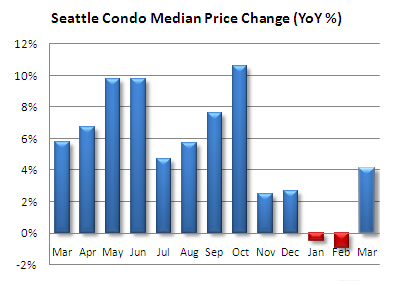 Though, prices continue to rise with a citywide increase of 4.1%. For the most part, condo prices are up throughout the city. Progressing towards Summer, we’ll see further increases in inventory levels, though that will be tempered with a corresponding rise in the number of sales. My outlook is for a sustained, stable condo market over the next several months. Stop pretending the Seattle condo market is a good place to put your money into right now. Thanks for stopping by; I appreciate your taking the time to comment. I find it ironic that you speak of credibity yet anonymously post a comment. You also may not have read the post thoroughly since no where did I intimate that it was either a good (or bad) market to invest in. I simply provided market data along with a few comments and let viewers interpret the information as they deem appropriate. Not everyone will agree with me and everyone’s situation is different. As for providing my real name, why wouldn’t I. This is my blog afterall; I stand behind the information that I publish. I’m being open and transparent with this blog by providing information that condo buyers/sellers will find useful and which may not be so easily to come by otherwise. I appreciate your blog and the information you pull together and provide. We really are not in a doom and gloom situation. Your pulled statistics prove this. I often ponder the state of our real estate market as all the data, press releases, and interviews go public and all sing a different tune. – That our market has normalized at the very best. 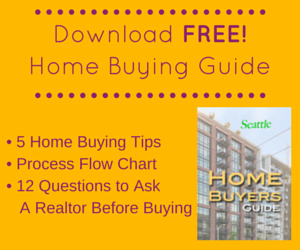 – That our real estate market median prices are inflated by about 30-35%. 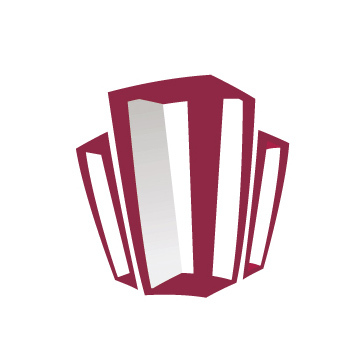 – Condos are struggling specifically downtown as high rises that have been on the market for some time have closed their sales centers due to lack of sales. – I do know that there are cash flow issues in the market as a result of lack of sales. 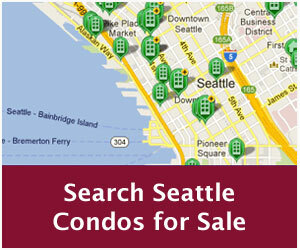 – Advertising has greatly reduced or halted on the majority of Seattle condo projects. – What about all the halted projects (ugly holes in the ground)? – What about all the condos and condo conversions that have turned into rentals? Now if sales have slowed, credit & financing practices have been overhauled & tightened, median prices are on the rise, and our country is on the brink or in recession how is it that our market is recovering or makes us gloom and doom proof? I anticipate the other shoe to drop. ALL economic indicators are telling a different story. Jeff – Thank you for your thoughtful comments on the market. I do agree the prices have escalated significantly over the past few years making homeownership out of reach for many, among other factors (credit issues). As for Seattle being over valued by 30%…perhaps that’s true in some instances but I’d be weary of blanketing the region with that figure, though. 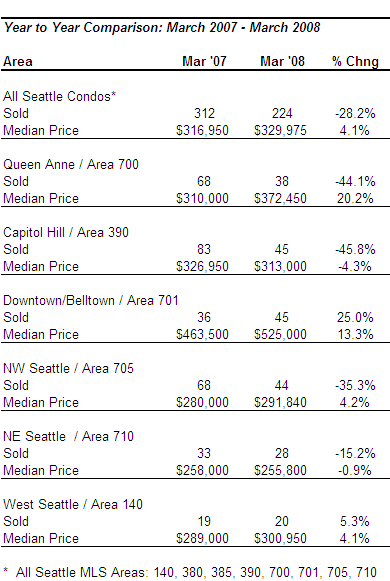 Citywide, Seattle’s condo market has normalized…at present. It is possible that the market will continue to soften with rising inventory, fewer sales and a tighter financial environment. Fortunately, the current level of sales to inventory is keeping us on the cusp between a normal and a buyers market. I do anticipate tougher times ahead for the high-end segment of the market. The financial issues, particularly with commercial and construction lending, which has halted a number of projects can actually be a good thing as it reduces the potential of additional inventory in the downtown core, further helping to stabilize the market. Also, the conversion of many new condo projects to apartments have eliminated several thousand units. That said, I don’t believe our market is immune from declining as witnessed in other parts of the country. The Seattle market will go down more. Liquidity is a major issue. Job losses are another….and they will continue as the economy falls deeper into reccession. We are in a downward cycle now and have yet to see the bottom. Seattle tends to lag behind national trends, but those trends do end up here. Be weary of any agent who says it’s a great time to buy!! And good luck getting a mortgage in a declining market! Potential buyers would be better off buying in Maimi, Vegas or AZ once the price declines start to go back to a positive trend. Oh, and those one-time strong markets have seen a 20-30% decline YOY. Anyone else have an opinion on this site? Jim – Thanks for your comments. The economic downtown will certain have an impact on the housing market. There is one additional factor I would add into the equation and that’s inventory supply. 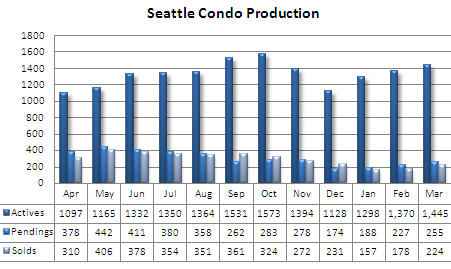 Preliminary figures for April indicates an increase in the supply rate but Seattle’s condo inventory supply has been averaging around 6 months. At 6 months, we’re pretty much fluctuating between a normal market and a buyer’s market. In other words, we’re stable at the present time. When we look at Miami, Las Vegas and Phoenix, we’re talking about a completely different beast. Miami’s condo inventory supply is up to 5 years, Las Vegas is hovering about 2 years and Phoenix about 1.5 to 2 years. Years, not months, of supply. 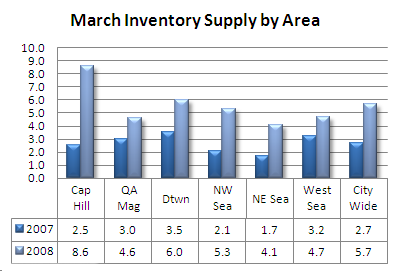 If we look at what’s on tap for the next 5 years, the possibility of Seattle’s inventory supply reaching Las Vegas or Phoenix levels is remote, which is why I don’t believe we’ll see 20-30% price declines in this market (though houses on the Eastside is another matter). The 6,000 to 10,000 new condo units visualized in the city core by 2011 is at best down to 3,000, if and only if, developers can obtain construction loans. My guess is that the number will be closer to 2,000 units. Thanks for the comments Ben!! I agree. I don’t think Seattle will see as large declines as some of the other cities, but that all depends on how severe the economic slowdown is and how long it lasts. There are some Doom & Gloom economists forecasting a 19% decline in home values for the Seattle area based on severe economic conditions. Again, it depends on the length and severity of the slowdown. 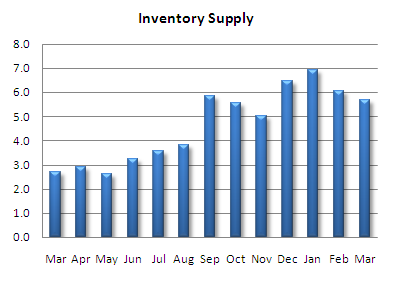 And yes, inventory is a significant factor. Builders are holding back on new and current projects. I think it’s a combination of a lack of liquidity to fund those projects and a decision to delay until the market is better. It’s a complicated market, and I’m glad I’m here and not in Miami or Detroit. I am just browsing this blog, as I often do, and noticed one of my comment posts back on April 23rd. I thought my logic made sense as I work in the industry and study it very well. Why has nobody else fully recognized what I had known and commented back in April? You know it is tuff to trust anyone that has influence in the Seattle Real Estate Market, specifically on the sales side that have been deliberately miss leading potential buyers and sellers about the condition of our market, some certain top executives of real estate brokerages have gone before the media on numerous occasions painting a misleading picture of our market deliberately in order to net sales driven by greed … SHAME ON YOU ALL who tell buyers and sellers that our market is bubble proof and that The Seattle Market will hold firm with no facts. All the signs were there and we have yet to hit the bottom. Honesty is the best business practice for longevity, not greed as you loose credibility! It is time to restructure the way you/we conduct business don’t you think?